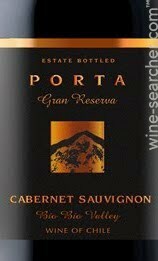 The main objective of this tasting is to explore and assess Cabernet Sauvignon wines from Chile. 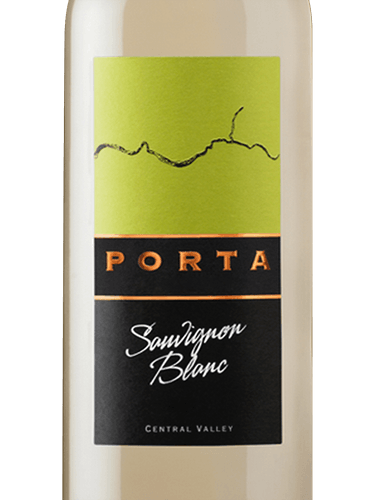 The Wine: Central Valley, Chile – Bright yellow in color, this Sauvignon Blanc hints to lively grapefruit and kiwi aromas, complemented with soft floral notes. The well-balanced and fruity palate features crisp acidity followed by a beautiful finish. The Winery: (From Wine Searcher) The Central Valley (El Valle Central) of Chile is one of the most important wine-producing areas in South America in terms of volume. It is also one of the largest wine regions, stretching from the Maipo Valley (just south of Santiago) to the southern end of the Maule Valley. This is a distance of almost 250 miles (400km) and covers a number of climate types. The Central Valley wine region is easily (and often) confused with the geological Central Valley, which runs north–south for more than 620 miles (1000km) between the Pacific Coastal Ranges and the lower Andes. A wide variety of wine styles and quality can be found in this large area, from many different terroirs. They range from the fashionable (and relatively expensive) Bordeaux-style wines produced in northern Maipo, to the older, more-established vineyards of Maule; from the coastal plains of western Colchagua to the Andean foothills of Puente Alto. With experimentation so popular in the modern wine world, however, it is the newer, cooler-climate areas which are receiving most attention, with the emphasis on the Andean foothills and the river valleys tempered by the cooling effects of the Pacific Ocean. The Central Valley is also home to a variety of grapes, but plantings are dominated by the internationally popular Cabernet Sauvignon, Merlot, Syrah, Chardonnay and Sauvignon Blanc. Chile’s ‘icon’ grape, Carmenère, is also of importance here, just as Malbec is to Mendoza, on the other side of the Andes. The cooler corners of the Central Valley are being increasingly developed, as winemakers experiment with varieties such as Viognier, Rieslingand even Gewurztraminer. The Wine: Winemaker Notes Showcasing a dark ruby color, this wine offers intense fruit aromas of berry, delicate cocoa, fresh herbs and light toast followed on the palate by harmonious flavors of ripe black plums and blackberry fruit. Medium-bodied, this wine has a persistent and complex finish and a structure that allows it to be enjoyed now or left to age for up to a decade. This wine can easily be paired with a great porterhouse steak to Penne Arrabiata. The Winery: ( From Wine Searcher) Viña Cousiño-Macul is a Chilean winery based in the Maipo Valley, just south of Santiago. It was founded in 1856 and is one of the only producers founded in this time that is still family-owned. Cousiño-Macul makes a wide range of varietal and blended wines from international grape varieties including Cabernet Sauvignon, Merlot, Chardonnay and Syrah. Much of the estate’s production takes place in the Maipo Valley. The original vineyards are located in Macul, a commune east of Santiago. The calcareous soils here are well-suited to Cabernet Sauvignon and Merlot production, and Cousiño-Macul’s top Finis Terrae wines are made from grapes sourced from this site. However, Santiago’s urban sprawl limited the size of production and so in 1996 Cousiño-Macul acquired 300 hectares (750 acres) of land in Buin, in the Alto Maipo. 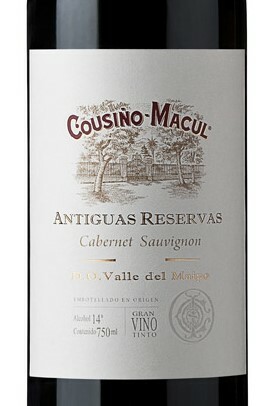 Cousiño-Macul’s third vineyard is located in Alhué, a coastal area of the Maipo, and is planted primarily to Carmenere and Syrah. In total, the estate’s three vineyards are planted to nine different red and white grape varieties, all of which are planted on their own rootstocks. These range from premium offerings to more value-driven wines. The Wine: This elegant wine balances strong character with softness. The bright fruit flavors are complimented by oak and notes of vanilla. Tannins are soft and silky in this full bodied wine. 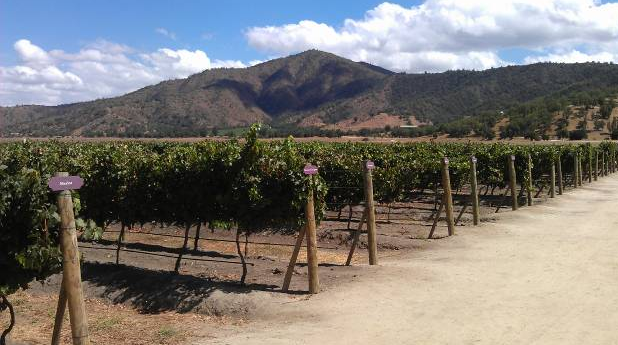 The Winery: The Maipo Valley is Chile’s most famous wine region. Set in the country’s Central Valley, it is warm and quite dry, often necessitating the use of irrigation. Alluvial soils predominate but are supplemented with loam and clay.The climate in Maipo is best-suited for ripe, full-bodied reds like Cabernet Sauvignon (the region’s most widely planted grape), Merlot, Syrah and Carmenère, a Bordeaux variety that has found a successful home in Chile.White wines are also produced with great prosperity, especially near the cooler coast, include Chardonnay and Sauvignon Blanc. The Wine: Aromas of baked blackberry are a touch earthy but mostly easy to process. This Cabernet feels solid but not overextracted. Malty, earthy flavors of baked berry fruits and cassis finish with coffee and mocha notes. Drink through 2021. The Winery: (From Wine Searcher) Concha y Toro is the largest wine producer in South America, with more than 8700 hectares (21,500 acres) of vineyards spread throughout Chile’s major wine growing regions. The extensive portfolio is divided into several ranges, led by four flagship wines from different grape varieties. The Don Melchor Cabernet Sauvignon from Puente Alto in Maipo is one of Chile’s first icon wines, sourced from a stony, mineral-rich vineyard on river terraces. Meanwhile, Carmín de Peumo is one of the first super-premium Carmenere wines, from Peumo in the Rapel Valley. 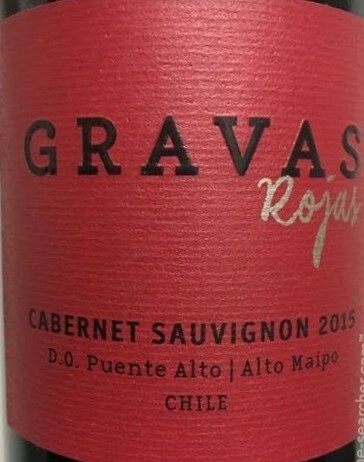 Gravas del Maipo is the company’s top Syrah, while Amelia is the flagship Chardonnay from vineyards in the Casablanca Valley. The company also collaborates with the Baron Philippe de Rothschild company, owners of Mouton-Rothschild, to produce the Almaviva red. This is sourced from some of Concha y Toro’s best vineyards in Puente Alto and has been one of the most highly rated wines in Chile since its first release in 1996. The estate was founded in 1883 by Don Melchor de Santiago Concha y Toro and his wife Emiliana Subercaseaux, with vines brought from Bordeaux. The current Marques de Casa Concha remains on the board of directors. In 2011 Concha y Toro bought the Californian portfolio of Brown-Forman, and thus owns brands including Fetzer, Bonterra, Jekel and Coldwater Creek.